When Northstar Commuter Rail line was just a glint in the eyes of exurban Republicans, they distributed this promotional material (on the right (dated March 5, 2003 in my files)). “Ridership on the Northstar commuter rail line will be about 20 percent less than forecast in its first year of operation, prompting one member of the Metropolitan Council to question whether the $317 million project was worth it. 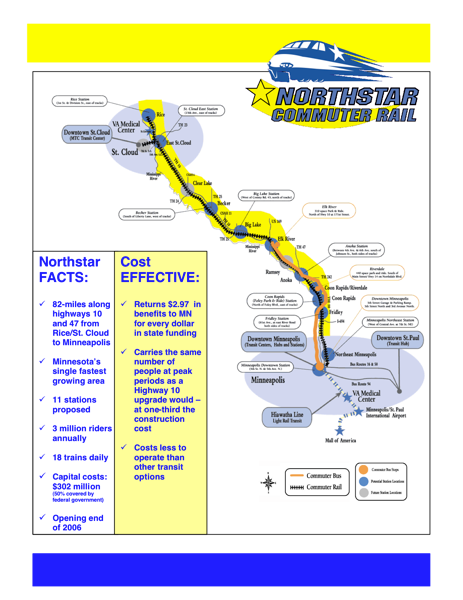 Officials had projected 897,000 riders total for the Northstar in 2010; after nine months – including the Twins’ season – it now looks like the annual ridership figure will be 715,000. As a result of the lower numbers, Met Council board members voted unanimously Wednesday to reject fare increases that for more than a year had been set to go into effect Nov. 15. “Do we ever unravel a transit project that is not successful enough to sustain itself?” asked District 2 Met Councilmember Tony Pistilli. “I’m not saying we should unravel Northstar yet, but do we have a definition of ‘failure’?” Pistilli, in life outside the Met Council, is chief appraiser and vice president of consumer banking risk management for U.S. Bank. The Northstar line debuted Nov. 16, 2009, connecting downtown Minneapolis with Big Lake, about 40 miles to the northwest. It was supposed to go the full 80 miles to St. Cloud, a train trip many are hoping becomes a reality soon. Anton, Lubov, & Associates (dated April 17, 2003) conducted an economic analysis “Northstar-economics (PDF)” of the line, and in contrast with the optimistic 1998 Parsons-Brickerhoff B/C ratio of 0.26, or the very optimistic 2002 MnDOT B/C ratio of 0.84, they came up with an incredibly optimistic B/C ratio of 1.15 for the line. Proponents will argue that the full line (to Metropolitan St. Cloud) was not built, which is of course true. However that unbuilt segment was expected to be a worse performer than what was actually built. If current ridership holds (979 persons using the line (round trip) per day (on a 365 day year)), this amounts to a $275,664 capital cost per person. On a per day basis: $61 round trip capital cost and $28 round trip operating cost per day. Or $89 per person. Fares are up to $7 one-way, or $14 round-trip. Assuming most trips pay the full fare (which they don’t), the daily subsidy is about $75 per day per rider. I have complained about this before. Decommissioning should be an option. Not every scheme works. Unlike the Pope, the Metropolitan Council and State Government is not infallible, and need not defend every decision of every predecessor. Every continued dollar supporting the long-distance commutes of a few exurbanites is a dollar that cannot be spent on something more important. If this kind of mischief were unique to Minnesota, we could pass it off as a mistake. However it is quite common in the transit promoters’ world. ‘Strategic misrepresentation’ as it is politely called has been well-documented by Kain, Pickrell, Richmond, and Flyvbjerg among others. Sure it’s time to start talking about under what conditions it might be right to decommission Northstar, or other transit lines, or highways. But it is not time to decommission Northstar. I’d wager that the vast majority of people who live along this line have never used a bus or train before in their lives, and it might take more than a year for them to work up the courage. This is a hurdle that may not have been faced in the more worldly south or west metro. Due to the excessive delays on exurb -> suburb highway 10 at the time, proving high CE was easy. We can’t be surprised ridership was low, the funding model was predicated on excessively high trip time savings for exurban riders. When the new Austin commuter rail line added all-day service, PEAK PERIOD ridership nearly doubled, plus 40-50 trips per midday train. That system is now at capacity during the peaks, severely limited by a very small fleet of 6 vehicles. This outcome suggests that commuters value the backup function of midday services, even if they don’t use them that often. When I worked for the City of Vallejo, our Baylink ferry system had several midday trips, which showed the same sort of pattern. I don’t know why U.S. transit planners insist that “commuter rail” be operated the “traditional” way, e.g., peak only services during weekday rush hours. The Swiss have the right idea, which is also a national standard: a MINIMUM of hourly all-day service, seven days per week, in most markets at least 16 daily round trips, e.g., from around 6:00 a.m. to 10:00 p.m. With such a service strategy, all trains except peak period extras should originate in St. Cloud, which should be an excellent source of midday and weekend ridership, given the presence of St. Cloud State University. To keep direct operating costs in check for such services, Northstar should purchase a half dozen diesel-multiple unit trainsets, relegating fuel-guzzling locomotive hauled trains to peak periods only. A model for this sort of “mini-corridor” is the various DMU services operating out of Melbourne, Australia, which carries more than 10,000 riders per day on routes similar to Twin Cities-St. Cloud.